Max Gimenis raises his check at the NY BJJ Pro. 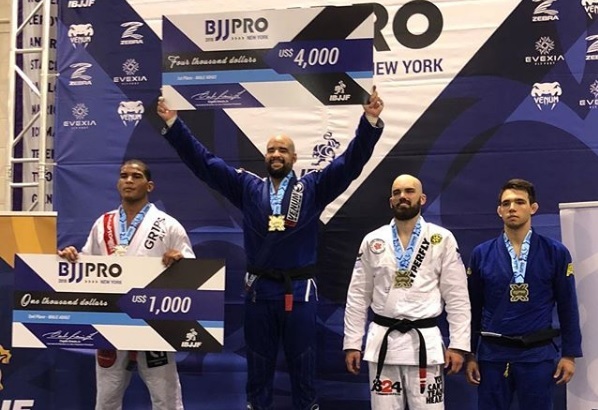 Last weekend, the city of New York welcomed the NY BJJ Pro, an event that pays cash prizes to the best of each division. As well as the women’s absolute divisions from blue up to black belt, the men’s weight divisions paid its winners, and well-known names could be found on the podiums. At ultra-heavy, it was Max Gimenis (GFTeam) who got the top prize. He faced Mahamed Aly (Lloyd Irvin) in the final and outplayed him to bag the gold medal plus 4,000 dollars. At heavyweight, Kaynan Duarte (Atos) soared. Still a newbie in his black belt career, he took the top spot on the podium that had Murilo Santana (Unity) coming in second, followed by Tim Spriggs (Lloyd Irvin) and Holando Monteiro (GD Jiu-Jitsu) sharing third. In the middleweight division, Manuel Ribamar (Unity) bested John Satava (Alliance), who took silver plus 1,500 bucks. Before that, in the featherweight final, Jamil Hill (Lloyd Irvin) showed he isn’t done riding the momentum from his recent world championship. The American defeated Thiago Macedo (Rodrigo Pinheiro JJ) in the final. In the women’s absolute, Cláudia do Val (De la Riva) beat Nathiely de Jesus (Unity), securing the 1,500-dollar check for herself. Read on to find out the complete black belt results.